​ Call (408) 321-2300 for a personalized trip plan or information on your nearest park and ride lot OR use the trip planner above. Customers can access Levi’s® Stadium for all events or stadium tours using VTA services. .
Use VTA's mobile ticketing app, EZfare, available for Apple or Android to purchase an Excursion Pass. 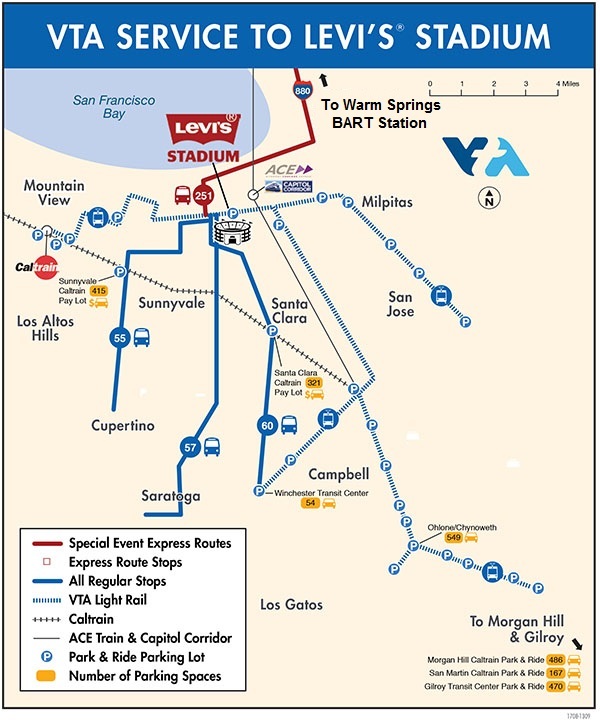 Light Rail Service: Customers can access Levi’s® Stadium for all events or stadium tours using VTA services. San Francisco/Peninsula - take Caltrain to the Mountain View station and connect with VTA light rail. Caltrain offers a joint adult Caltrain/VTA Day Pass for an additional cost. The joint pass is valid on Caltrain through the last train of the night and on VTA until 3 a.m.
San Jose Airport - Take the Free VTA Airport Flyer to the Metro/Airport light rail station then take light rail to "Mountain View" or "Great America/Levi’s® Stadium" from the platform directly across from the Airport Flyer bus stop. 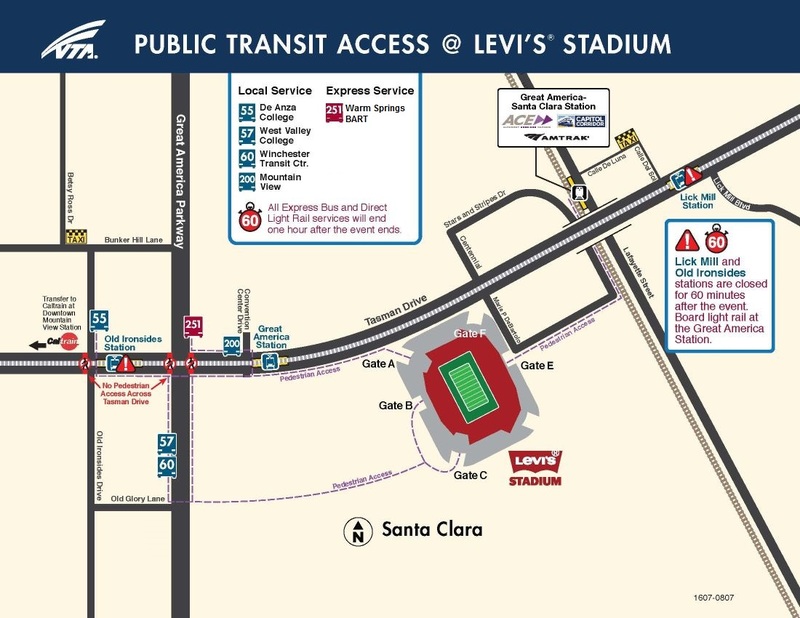 We provide a number of free park and ride options for light rail and bus service to Levi’s® Stadium. You will not have access to a Ticket Vending Machine when you leave the stadium, so buy an 8-hour Excursion Pass (light rail only), or load a Clipper Card, before you come to the event. Single Ride tickets will not be sold at the stadium. Load cash value on your Clipper card. Each rider must have their own Clipper Card and make sure enough value is loaded to get to and from the game. You can download VTA's EZfare mobile fare app and purchase Excursion Passes for everybody who are traveling together. Purchase an 8-Hour Excursion Pass (for light rail use only) at the Ticket Vending Machines (TVM) at the start of your trip, which you can use again after the game. The Excursion Pass costs the same as purchasing two one-way tickets. Ticket Vending Machines accept Debit/Credit cards. When using a VTA Bus to get to the stadium, you can use your Clipper card or cash to pay for each ride. Lines 251 requires an express fare. Caltrain is also offering a joint adult Caltrain/VTA Day Pass. The Caltrain portion is valid to Zone 3 - perfect for customers heading to Levi's® Stadium or Great America – and costs an additional $7* compared to a Caltrain Day Pass. The joint pass is valid on Caltrain through the last train of the night and on VTA local buses and light rail until 3 a.m. It is not valid on VTA Express service on 49ers game days. The pass should be purchased at your boarding station, not at Mountain View. More VTA fare information can be found by visiting our fares page. Q: What is the postgame schedule for my light rail/bus? A: Return service will begin after half time to get customers back to their starting point. We will have light rail trains and a line of buses ready to go but we will require that they be nearly full before starting the return trips. It seems that many customers leave events early to avoid the crowds, so it should not be a problem getting enough people on board. Also, once a light rail/bus leaves, another will be by shortly after to fill and keep people moving. Q: I do not see my station listed will light rail stop at every station? A: Yes, on our printed and online schedules we only list major time points for reference but trains will stop at all stations if someone is deboarding or waiting to board. You can use the listed timepoint prior to your stop for reference when planning for departure/arrival times. Q: Will there be enough express buses for each of the times listed to accommodate everyone who shows up? A: Yes, we will use multiple buses as needed to ensure that everyone gets a ride to and from the stadium. Q: I have never used VTA before will there be any VTA staff out on the event day in case I have questions? A: Yes, we will have ambassadors at the stadium and key light rail transit centers answering questions and helping customers reach their event. Q: I am coming from Caltrain, where can I connect with VTA to get to Levi’s®? A: VTA connects with Caltrain at the Mtn. View, Sunnyvale and Santa Clara Stations. Please go to www.caltrain.com/events for more information. Customers can access Levi’s® Stadium for all events or stadium tours using VTA services. Refer to the calendar below to see if Extra Service (including Line 251) will be offered. Service schedules for events with extra service will be available 4 days before the event. TRAVEL ADVISORY - Please be aware that Levi's®​ Stadium has a strict Bag Policy that can be reviewed.